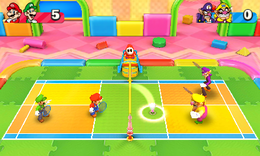 Badminton Bash is an Extra minigame from Mario Party 10. It reappears in Mario Party: The Top 100. The players are both at a badminton net. The minigame itself is basically badminton in the real world. There are two types of shots the players can take - a smash and a drop shot. If the player manages to subdue the ball in the opponent's side, they get a point. The first player to manage to exceed their opponent by 21 points wins. There is also a doubles mode that 4 players can play, although it always restricts teams to P1/P2 vs P3/P4. "Try to score with smashes ( ) and drop shots ( )!" Description – "Play badminton and reach the point goal before the other team!" On-screen – "Reach the point goal first!" This page was last edited on October 11, 2018, at 07:08.